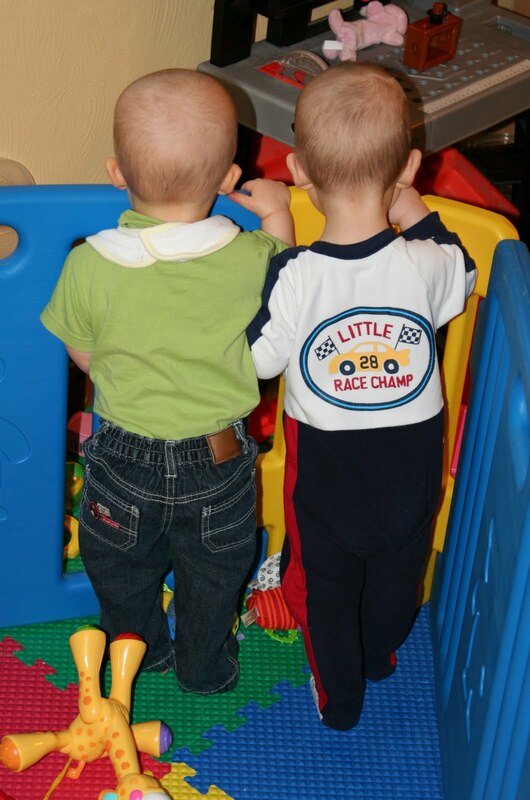 Throwing toys and food, chasing each other, biting each other or me, climbing everything possible – the boys have fully entered toddlerhood. Juliana was never a biter and although she was a busy toddler she wasn’t like this – I don’t know if it’s because they are boys or twins or a combination of the two. Climbing is the most dangerous activity and their favorite thing to do. 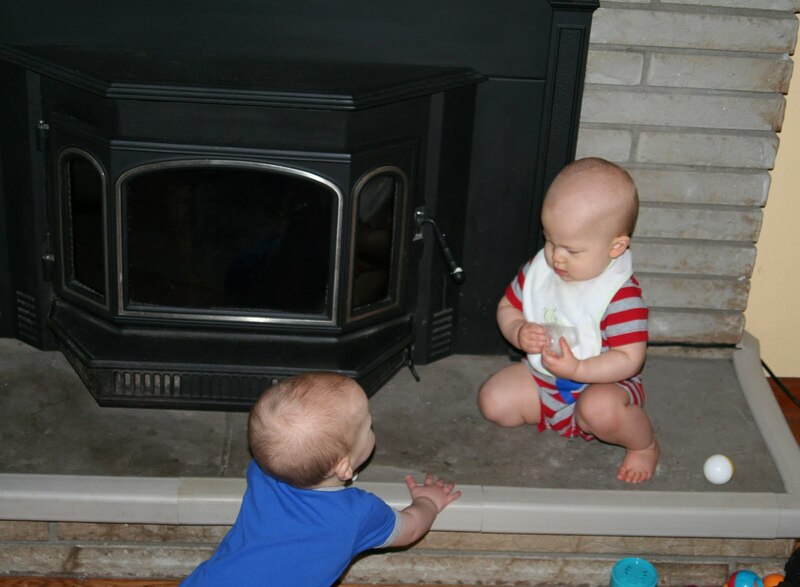 As soon as Ruslan is on the floor he quickly crawls to the fireplace, climbs up on the hearth and starts banging on the wood burning stove. Then Wyatt realizes he is missing out on the fun and joins him. 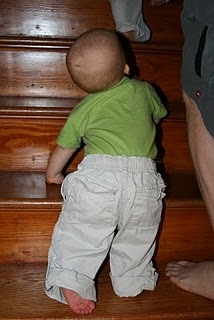 Wyatt will sometimes get down on his own if someone yells at him to get down. Ruslan thinks this is a really fun game and giggles when I pick him up. If we ignore him, he will eventually get bored and get down on his own. But it isn’t a safe place to play so we can’t leave him there – it is elevated and he can easily fall and get hurt and he had figured out how to open the stove which leads to pinched fingers and ingesting fireplace ash and all sorts of bad things. They are starting to understand that they can stack larger toys and use them as steps to get things that are just out of reach. Of course they watch each other and learn by example. They both bite on occasion – other than me and occasionally each other, they bite non-living objects. Wyatt likes to chew on the seams on the couches. We have foam around the coffee table so that they don’t hit their heads on the corners and Wyatt has started biting pieces off and chewing on them until I pry the pieces out his mouth getting my fingers bit in the process. 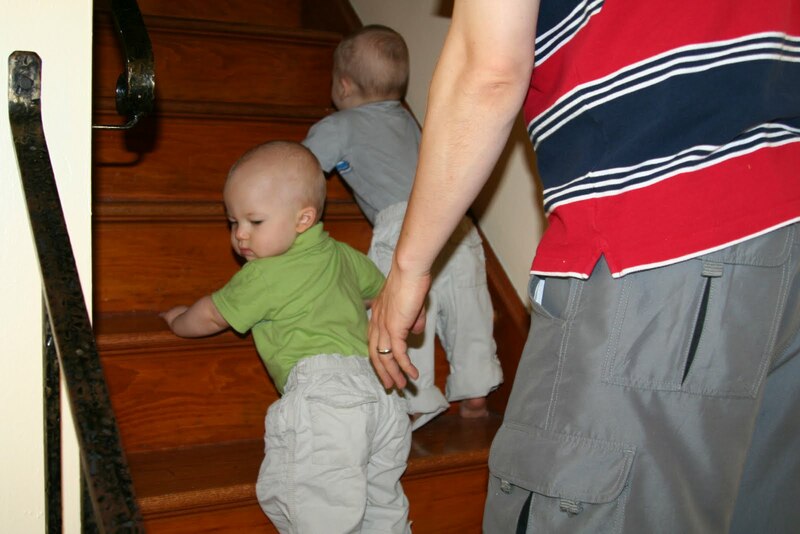 Having their diapers changed = being forced to remain in the same place for 10 seconds and that is unacceptable to boys who need to be on the go at all times. This torture is met with screams and wrestling them to hold still until they are clean and the new diaper is attached. 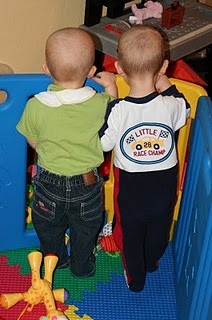 Dressing them is a lengthy process trying to contain them and get clothes on, usually they escape at least once, happily crawling away half-dressed and laughing. This past weekend, Wyatt realized that he can crawl from the fireplace hearth onto one of the couches. He scrambled up and then as I was running across the room to get him, he fell off the couch into the small space between the wall and the couch. No injuries and certainly not a deterrent to avoiding such a fun climbing adventure. 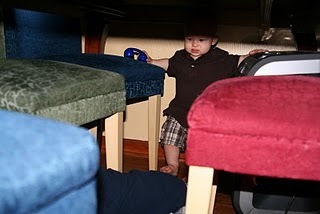 If he had not fallen, his next move would have been to climb over the back of the couch into the play area. Usually when we take them outside to play in the front yard, they happily play in the same area. Yesterday I went outside on my own with Juliana and the boys and they spent the entire time racing in opposite directions. 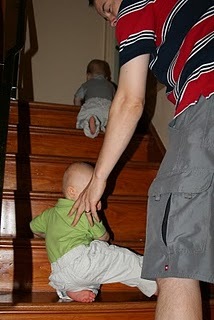 Wyatt took off toward the street while Ruslan headed toward the drop-off from the lawn to the driveway. It was not the relaxing outside playtime I was anticipating. And climbing the stairs, of course.